In June, EJOLT collaborators were pursuing dissemination of research results in European policy and academic circles. This work is less mediatised, but our readers might occasionaly want to hear on EJOLTs work ‘behind the scènes’. We’re not only doing research, publishing our results and building a global movement through this website and our social media. The policywork component of EJOLT is building momentum, as the results start to pour in. At the two-yearly gathering of the European Society for Ecological Economics (ESEE), almost a dozen EJOLT researchers presented their work through presentations and posters. The event in Lille was perfect for networking and making connections with other academics in the fields that we cover. The poster explaining our work on the database of environmental conflicts sure raised expectations in the research community. In Brussels, EJOLT partner ANPED joined hands with the European Environmental Bureau (EEB) and CEEWeb from Hungary to organise a workshop on capping resource use. While the most innovative tools for limiting resource use were discussed, we also presented the policy brief on our latest report, concerning ways to keep the unburnable fuels under the ground. This 4 page briefing is aimed at EU policymakers and it was presented to Manfred Rosenstock from DG Environment and a public that included politicians and people within administrations. On the same day, 18 June, MEP Philipe Lamberts hosted an event in the European Parliament on Ecological Economics and Policy. The event explored the linkages of Ecological Economics to the EU-level environmental policy making, including the EU’s research area. 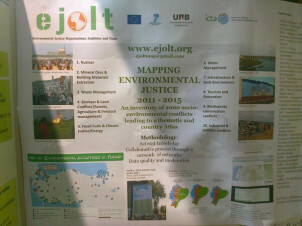 EJOLT’s project coordinator Joan Martinez Alier and deputy coordinator Beatriz Rodríguez-Labajos participated in the event. Meanwhile, EJOLT members Leah Temper, Hali Healy from UAB, Patrick Bond (CCS) and Nnimmo Bassey (ERA) participated in a 3 day think tank on Environmental Justice hosted by Thomas Sikor and the Global Environmental Justice Group at the University of East Anglia, Norwich that united some 20 people from various activist, academic or mixed backgrounds, all working on environmental justice. Participants came from countries such as Sudan, Venezuela, Peru, China, Vietnam, Nigeria, South Africa, and across Europe to share experiences, opinions and to work towards creating a platform for further conceptualization around Global Environnmental Justice. The workshop also included a field trip to visit the village of Happisburgh, Norfolk, the site of the earliest human colonization in Northern Europe — and also perhaps the augury of the end of civilization. Happisburgh is falling into the sea due to coastal erosion and rising sea levels related to climate change. Every year they lose at least one house over the cliffs. We met with local activists from the Coastal Concern Action Group at the Happisburg lighthouse who have been working on community responses to the rising tide. CCAG has gained national and international recognition for its work campaigning for proper coastal governance and environmental and social justice.